While it can be good to see products in person, there's no denying you can save a lot just by shopping online for your beauty fix. As someone who regularly buys online, I thought I'd share 5 of my top favourite places to shop for beauty, some you may be familiar with or some which might be new to you. First up we have Cult Beauty, an online retailer which takes a different approach. Instead of stocking a full range of products of each brand, each product is carefully selected because of it's reputation or cult status. This means that everything you see on the website has been recommended by an expert panel of beauty insiders and celebrities so you know whatever you're buying is going to be good. It's also the home of brands which are typically hard to find, including a few from the Asian beauty market. Delivery is always extremely quick (even for standard!) and there's always an offer going on. If I'm in need of a Mario Badescu fix, I always head straight for Beauty Bay. They're more along the lines of your typical online retailer but the main selling point is the choice of products. It's always a great place to find HD Brows or Anastasia Beverly Hills products too. I find this one of the best shops for shipping as it's free for orders over £15, not only for the UK but for worldwide too. If you plan on spending over £50, you also get bumped up to their premier service which includes a free deluxe gift and your order gets pushed to the front of the queue at no extra cost. If I'm feeling spendy then I head straight for Space NK. It's filled with all the high end brands you can wish for, including some exclusives from brands like NARS or Kevin Aucoin. While the shipping is slightly more pricier at £5, you do get 4 free samples you can choose yourself and they always use my favourite couriers. If you're lucky they do sometimes offer free delivery so it's best to stock up then and earn some N.Dulge loyalty points for your next spending spree. The sale time is always worth waiting for too. One website that's a little less known than the others is iHerb, which on first glance looks pretty dodgy but it's 100% legit. If you're a natural skincare fan, this website is for you. It has the likes of Weleda and Lavera, plus a huge range of vegan and cruelty free brands you've probably never heard of. Aside from skincare, the makeup section also includes Physicians Formula, ELF and Eco Tools. Though the main reason I shop here? A massive discount on Real Techniques brushes, sometimes even half the price you'd pay here. The only downside is that you'll be waiting around 2 weeks for your order as it comes from America but with no customs charges and amazing savings.. it's definitely worth it. If I don't have time to hit the shops but I need my beauty fix to arrive fast, ASOS is the place to go. There's a great range of both drugstore and high end brands available and is probably the easiest website to navigate. I often find products to be a little bit cheaper and there's always offers going on so you can save a little bit of money too. 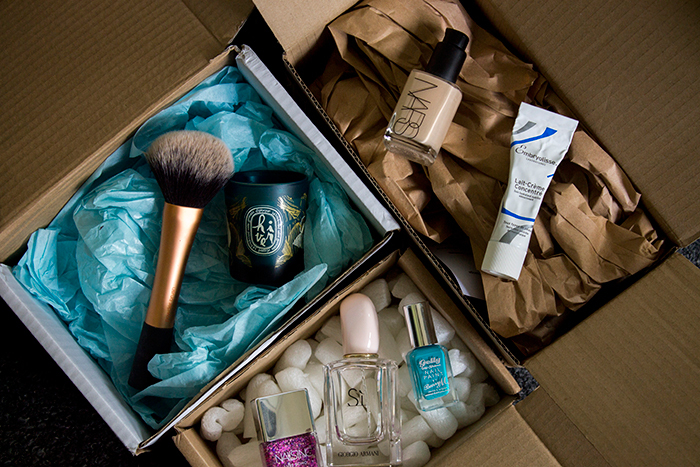 Take advantage of the Premier delivery service at around £10 a year and makeup will be with you the very next day. Those are my top 5 online beauty retailers! If you have a favourite place to shop, let us know in the comments below.